The Dutch champion crashed in the final 500 meters of Wednesday's Nokere Koerse. Reigning cyclocross world champion Mathieu van der Poel crashed hard in the thrilling finale of Wednesday’s Nokere Koerse, which was won by Dutch rider Cees Bol (Sunweb) in a chaotic sprint. Van der Poel was unable to finish the race, and was taken to a local hospital in an ambulance. TV cameras showed team officials and medics attending to van der Poel as he lay on the ground clutching his back and shoulders several hundred meters from the finish. In the hours after the crash, his Corendon-Circus team said in a statement that a medical exam revealed no broken bones for the Dutch champion. The crash occurred shortly after the peloton rode onto a section of cobblestones just 500 meters from the finish line in downtown Koerse. Sunweb’s Max Walscheid also went down, and the ensuing pileup took down van der Poel, Floris Gerts (Tarteletto-Isorex), and Matteo Moschetti (Trek-Segafredo). Jonas Koch of Team CCC crashed into van der Poel, but was able to remount his bicycle and finish. 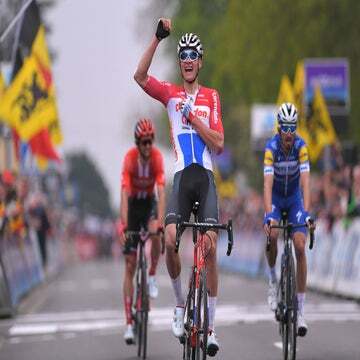 The race marked the opening of van der Poel’s 2019 road cycling campaign. He is slated to compete in Gent-Wevelgem, Dwars door Vlaanderen, and the Ronde van Vlaanderen, after his team secured wildcard spots to the events. The team said the injuries should not keep van der Poel from competing in these races. “With these circumstances, he will be able to complete his road program as planned,” the team statement said. Bol won the sprint ahead of Pascal Ackermann (Bora-Hansgrohe) and Jasper Philipesen (UAE Team Emirates).